Mary Scribner's essay "The Teen Years - Can a Steel Stud Look Like a Pimple?" 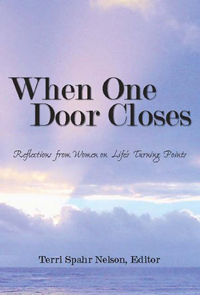 is featured in When One Door Closes - Reflections from Women on Life's Turning Points, edited by Terri Spahr Nelson (2010). The book is a collection of personal stories about the challenges and joys of parenting. Bainbridge author Elizabeth Coplan is also included in the compendium. For more information please go to http://www.reflectionsfromwomen.com/.